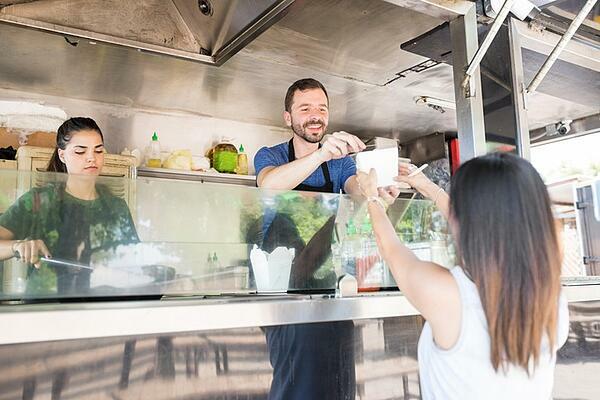 Food trucks are one of the hottest new trends in food service today. Statista reports that in 2015, the value of the U.S. food truck industry increased to more than $850 million and is expected to grow by another $140 million by 2020. Estimates vary widely on how many food trucks are out there today cruising America’s city streets. However, one thing is certain – this rapidly growing industry presents a unique kind of fire risk and one that poses significant dangers to food truck operators and the people they serve. According to a presentation at the 2015 National Fire Protection Association (NFPA) Conference, between 2011-2015, there were 21 injuries and two deaths resulting from food truck accidents in the United States. In light of these statistics, the NFPA has issued new minimum fire safety requirements for food truck and food trailer operations in the 2017 edition of NFPA 96, Standard for Ventilation Control and Fire Protection of Commercial Cooking Operations. Clearly, the fire service has begun to realize the risks associated with fires inside food trucks and trailers and the dangers they pose to the public. Operators need to understand them, too. In addition to the normal risks you might expect with any vehicle that runs on gasoline or diesel fuel, the three most significant fire risks unique to food truck operations are propane, portable generators, and cooking without proper fire suppression equipment. Propane is perhaps the most significant risk of fire in a food truck. According to the NFPA, about 68 percent of food truck fires are related to propane, due to either leaks in the tank or a structural failure. Almost all of the incidents resulting in injuries and deaths in the past four years have been the result of propane explosions. Cooking with propane is generally considered safe. Few people realize that the 20-pound propane cylinder they have attached to their backyard grill contains the explosive power of 170 sticks of dynamite and can generate more than 425,000 British Thermal Units (BTUs) of energy in an explosion. When you consider that it takes just a little over 200 BTUs to boil a pot of water, you begin to understand the power contained in that cylinder. If you’re a food truck operator, you are probably driving around with at least one if not two 100-pound propane cylinders inside your vehicle capable of exploding with more than 2.5 million BTUs -- enough to instantly ignite and burn anything and anyone in its path. Because food trucks are commonly parked at events or lined up along streets where large numbers of people congregate, the propane they carry creates an enormous risk in a very small space. Part of the problem is that food trucks are constantly on the move, often driving over potholes that loosen the connections and fittings on propane tanks or cause other structural damage. The frequent jostling of the tanks, as well as a failure to properly tighten the fittings when swapping tanks out, can lead to propane leaks. With trucks that carry their propane inside the vehicle, propane leaks can become deadly. This is because a food truck is an enclosed space and propane is heavier than air. So, when it leaks from the tank it will tend to pool near the floor of the food truck, and with so many possible ignition sources in a food truck, a propane leak can quickly become a recipe for disaster. Those same ignition sources can make swapping out propane tanks highly hazardous, too. Propane tanks carried on the outside of the trucks might be a little safer with regard to leaks, but they still carry the risk of exploding on impact in even a minor collision. The portable generators that food trucks rely on to provide their electrical needs can also create a fire risk. Generally, these risks are greater in vehicles that have been converted into food trucks as opposed to newer food trucks that have been built for cooking operations. In older food trucks and vehicles converted into food trucks, carbon monoxide can be created from a generator that has not been properly vented or from the electrical system itself. Many do not have proper storage needed to keep the fuel required to run the generator safely away from ignition sources in such a small space as there is within a food truck. Hood suppression systems over ovens, burners, grills and fryers have long been required for commercial kitchens. However, hood suppression systems may be absent in older food trucks or vehicles that have been converted into mobile kitchens. While most food truck operators carry portable fire extinguishers, they often do not realize that they need two types to cover the types of fires they are likely to encounter -- a Class K extinguisher designed to suppress grease, fat or cooking oil fires, and an ABC extinguisher capable of putting out fires involved paper such as napkins, food wrappers and other types of fires. In all but a few cities, food trucks fall into somewhat of a gray area when it comes to fire safety regulation. Unlike brick-and-mortar restaurants, which have clear regulations regarding the kinds of fire safety systems they must have in place, the same requirements don't fit the size and structure of a mobile kitchen. And because they are mobile, food trucks also do not fit the definition of a temporary structure covered under building or fire codes like a kitchen operating under a tent at an event would be. The NFPA offers a practical checklist that operators can use to assess their risks and identify where improvements can be made to improve safety. The International Fire Chiefs Association (IAFC) offers a free webinar to promote awareness of the risks associated with food trucks and trailers as well as permitting and code compliance. The NFPA Journal podcast released an episode on Food Truck Fire Safety on June 9, 2015, which discusses fire and life safety on food trucks. Install an automatic fire suppression system in your food truck that includes a manual switch, and have the system professionally inspected every six months. Keep portable fire extinguishers on board including a Class K extinguisher for grease fires and a Class ABC extinguisher for other types of fires. Have both your fire extinguishers and propane tanks hydrostatically tested and stamped with the testing date to ensure their functionality is not compromised in any way. Conduct regular inspections and maintenance of your electrical equipment to identify hazards such as frayed cords or wiring, cracked or broken switch plates and combustible items near power sources. Have the kitchen exhaust system within your food truck regularly inspected for grease build-up. The frequency of inspections, which is defined in NFPA 96, will depend on the volume and type of cooking you do in your operation. It's also important to be prepared to respond quickly in the event of a fire. At least one employee on every shift should be trained on how to shut off the propane and electrical power. And, every employee should know how to safely exit the vehicle and be prepared to lead customers away from the truck should a fire break out. If you run a food truck or trailer, you’re driving around with a lot more at stake than you may have realized before today. While local codes may not yet be in place to mitigate the fire risks associated with your operation, they will be. Identifying and mitigating your risk today will give you the peace of mind you need to hit the road tomorrow. Koorsen can help. Our Fire Safety Experts can provide guidance on the new NFPA requirements to help you comply now and help you properly test and maintain your propane tanks and fire extinguishers. Call Koorsen today to get started.